Who is your प्रिय confirmed Pokemon? Which character do आप want for the अगला ssb game? Which new character are आप most excited about? आप are most looking आगे to seeing Kirby's changed form after absorbing...? Would आप guys like to see the characters from Kodansha Comics to be in Super Smash Bros ? Who is/are your प्रिय character(s)? Link: Mario... MARIO...! Well, He's not in the street, या the sidewalk, so I should look in these houses. Mario: Are आप sure this is the right place? Link: Of corse it is! My parents told me a rumor once that if the people on Good Side निनटेंडो सड़क, स्ट्रीट made video games for the kids, the Evil Side निनटेंडो सड़क, स्ट्रीट folk would control the minds of every kid on Good Side निनटेंडो Street. Mario: What is it with these people on Good Side निनटेंडो Street? I have to put a stop to this at once... but how? भेड़िया appeared. He caught Snake. TV:Yes, Today only get a wii या xbox360 for 100$! I have a question. What should happen in the अगला game. I think the bad guys should revive Tabuu and then Tabuu orders Petey and Porky to rebuild the great maze.All the others are sent down to attack the world of trophies. Meanwhile pichu, mewtwo and roy have all returned when the bosses attack. What should happen in the अगला game. It's your thoughts. Also I think that Mr. G&W should retire, don't you? Also what boss would आप like to see again? And should the halberd be repaired and stolen again and all that crap? Time to vote for the अगला stage in the अगला game of super smash bros! 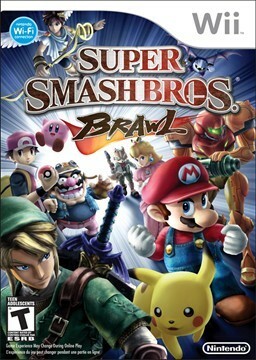 After unlocking everyone, how many playable characters are there in Brawl?